The San Diego City Council Wednesday approved a slate of committee chairmanships for next year and made Councilman Barbara Bry the council president pro tem, the panel’s second-in-command. In doing so on a 6-3 vote, Councilman Scott Sherman was stripped of his chairmanship of the panel’s Smart Growth and Land Use Committee, which he led this year. He will not chair any committee in 2018. Sherman accused colleague Myrtle Cole, chosen to serve a second year as council president, of going back on her written word that she would keep him as head of the Smart Growth panel. He noted that for last week’s council president vote, all of those who spoke out in favor of Cole were organized labor leaders. 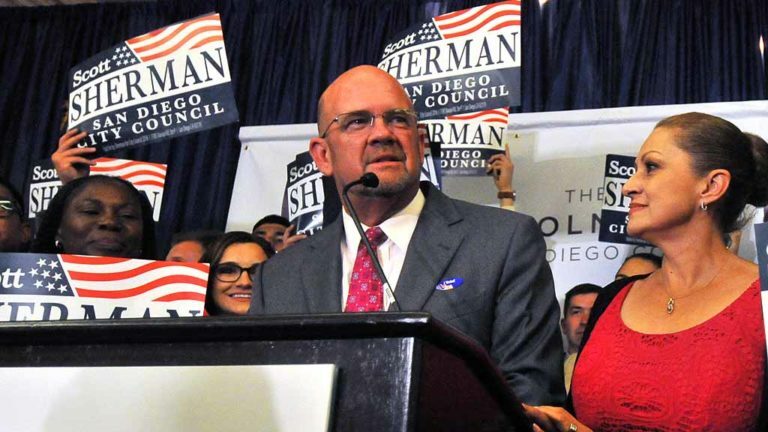 Sherman is fiercely opposed by labor union heads, who have called for more Democrats in leadership roles on the council. The demand was difficult to meet one year ago since three Democratic members were brand-new to office. Sherman called the decision to remove him as chairman one that was “very disappointing” and put the “dysfunctionality” of the council on display. Democrat Georgette Gomez, who just completed her first year on the council, will become the chair of the Smart Growth committee, which oversees affordable housing and related issues. While the Republican Kersey was replaced as council president pro tem, he will remain head of the Infrastructure Committee, a post he has held since joining the council five years ago. City officials have made significant progress in getting their arms around the city’s substantial needs in capital projects and maintenance since Kersey has been in the role. Like Gomez, the Democrat Bry also just completed her first year on the council and earned plaudits for her leadership of the Budget Committee, which she will continue to chair. Democrat David Alvarez will continue to chair the Environment Committee, sophomore Democrat Chris Ward will take over as chairman of the Economic Development and Intergovernmental Relations Committee and remain chairman of the Select Committee on Homelessness; Republican Chris Cate will continue to lead the Public Safety and Livable Neighborhoods Committee, and Republican Lorie Zapf will take over the Audit Committee. Cole will continue to head up the Rules Committee.